Author: Beloo Mehra; Published in the Annual Issue (2016-17) of Sri Aurobindo’s Action, West Bengal, pp. 85-105. Imagine if we were to replace the word ‘secularism’ by the Indian ideal of sarva dharma sambhava. (Please read the previous part to see how this idea does NOT translate to mean that ‘all religions are equal or same’ or that ‘all paths to truth are equal or same.’) We now see a whole new picture. The term secularism is now broadened to incorporate a spiritual view of existence – spiritual not religious, mind you, because it accepts dharma as the basis for a progressive and gradual growth of the individual and society. It rids itself of the artificially constructed dichotomy of what is sacred and what is not, what is spiritual and what is temporal. Education must be secular (or should we say, dharmic) in this new sense of the term. Education will now become more “whole-istic” in its approach to learning and teaching because it will not be limited by a narrow material view of existence. It must be emphasised that this is not a recommendation for introducing ‘Spirituality’ as a separate subject – mandatory or optional – in school or college level of education. That will never work, and not just because there can be no unanimous understanding of what spirituality really means. There is always a real danger of reducing spiritual education to book-based religious or moral education, which will be a regressive movement. Spirituality is not something that can be taught as such, it is fundamentally an approach to life, a vision for what it means to be an individual and the aim of individual life, as lived in the society and as lived within. To further clarify, the need of the hour is that our education must be wholly guided by a spiritual view of the aim of human life and the education’s role in helping the individual prepare himself/herself for that aim of life. A truly India-centric education will be based on the spiritual view that proper and gradual development of all parts of an individual is essential not as an end in itself but as a means to grow in one’s soul, because the soul manifests and expresses itself through its outer instruments of mind, heart, and body. Everything else begins to take on a different and deeper meaning when this fundamental view becomes the basis for all our work in the field of education. When all the domains of life and all creative, intellectual, aesthetic, ethical, social pursuits get immersed in the deep ocean of spiritual waters, when a seeking for the invisible guides all visible pursuits, then the distinction between not-sacred and sacred begins to blur. Everything becomes a sacred way to seek the sacred in everything. All ways of seeking, all relative truths can co-exist in such a view. Like some of the great Rishis of the past, Sri Aurobindo too has spoken of such a spiritual view of existence that takes up all that is ordinarily understood as secular within its fold and raises them to the light and grandeur of spirit. And this view of existence must be the basis of a true Indian education. It will integrate spirit and matter because it recognizes that Matter too is Spirit in disguise, and that Spirit is involved, hidden in the Matter. Such a view of existence will integrate spiritual and secular because for it nothing is outside the scope of spirit. A true Indian education will not reject any aim of life, will not exclude any activity, but will take them all and steer them toward a greater purpose to facilitate in the learner discovery of the higher self. It will not reject matter or learning and mastery of the matter, but it will direct learner to view matter as only a limited manifestation of the spirit which is involved in it. It will aim to develop the physical, the mental, the emotional, the aesthetic parts of learners not only because they may have a greater satisfaction or because “that is man’s finer nature, because so he feels himself more alive and fulfilled.” It will aim to develop all these parts also and primarily “because these things too are the expressions of the spirit.” In a true Indian education learners’ moral and ethical development will be much more than a means to develop well-regulated individuals and social conduct which keeps society going and leads towards a better, a more rational, temperate, sympathetic, self-restrained dealing with fellow-beings. Such moral and ethical development – both for the learner and teacher – will become a means for greater self-discovery and self-becoming. An important goal of Indian Education must be to help learners gain a healthy love and pride for their motherland and a deeper awareness of the Indian spirit. But facilitating such a learning about India, and especially about the deeper Indian spirit is not an easy task. For that matter, teaching about any culture is challenging. But India poses a rather big challenge because of its extremely rich diversity and a great many contradictions that can often make it difficult to dig deep into that one thread of inner unity running through it all. How should India-centric educational thought and practice address this concern of unity in diversity? A truly Indian educational thought and practice will first and foremost recognize a fundamental Vedic truth: Ekam Sat, Vipra Bahudha Vadanti (Truth is One, sages call it by many names). This provides the much needed philosophical framework that allows for multiple and relative truths to exist within a Universal, Absolute Truth. Can such an ideal be practiced in real world? Let me share a very practical example –this time from the point of view of those in charge of running an educational institution. Sometimes because of their zeal and passion to do all that they think is good for their learners, educators’ concerns become limited only to the needs of their students and they fail to see that for a proper functioning of the school (including curricular matters) there are several other groups of people including sweepers, canteen-folk, maids, bus drivers, clerks, other school staff etc., whose cooperation or participation is just as much essential. When initiating any change in the curriculum or implementing any new pedagogical innovation or approach, teachers and school administrators must be mindful of all that must be done in order to ensure that all the other groups of individuals working in the school are made aware of and are agreeable to any changes that may be made to their workloads or the nature or extent of their works. Also, educators must be mindful of the fact that their day-to-day lesson planning should also incorporate thinking through the role or extent of participation of various other groups in the school. This practice requires an expansion of our habitual way of thinking and trying to plan an event/project in as much detail as possible. And certainly it necessitates listening attentively to all the diverse opinions, concerns and perspectives that will be shared by different groups of people whose work lives will be impacted by the proposed changes. In such situations only an exercise such as thesis, antithesis and synthesis can help arrive at a larger unity of diverse perspectives or viewpoints. Working with the diversity that exists within the individual learner, the various parts of his being – physical, emotional, mental – must also be the occupation of education. And at the same time diversity among the learners needs to be carefully dealt with. This may become possible only when class size is much, much smaller than what we see in our mainstream schools at present. A truly Indian Education will always encourage learners and educators to stay open and receptive to new knowledge, new insights, new interpretations, new truths – from all sources. It will do this because it will be based on the Vedic Truth – Aano bhadrah kritavo yantu vishwatah (Let noble thoughts come to us from every side). This Truth has great implications for curriculum design and selection of study material for learners. If only those in charge of this highly important work for the country’s future can somehow set aside their ideological and fixed beliefs about what is true and what is right and can instead provide the learners with study materials and learning opportunities that are not one-sided or narrow in approach. HAVE YOU READ PARTS 1, 2, 3, 4? How wonderful – if only such education could be worldwide. Perhaps as it is established in India, Indian teachers can be “avatars” of such education and help raise education to at the very least, the sattwic level, and show the way beyond that to a truly spiritual vision! Thanks Don for your wonderful and encouraging comments. O how I wish Indian teachers could be instrumental in raising the work of education to its higher, sattwic levels. The present reality is however quite the contrary. But still if more and more people become open and receptive to the working of Mother’s Force, who knows how things will continue to shape in the decades to come. I have faith. 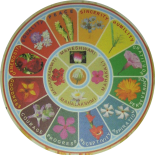 This entry was posted on March 21, 2018 by Beloo Mehra in Education, India and tagged Holistic Education, Indian Culture, Indian Renaissance, Spirituality in Life.